The Rite of Christian Burial for Catholics consists of a Vigil Service during the evening before, the Funeral Liturgy on the day of (usually a Mass) and the Graveside Service accompanying the burial itself. The Church does allow cremation and teaches that the cremains should be treated with the same dignity as the body. The Vigil Service usually occurs before or after a period that is set aside for relatives and friends to view the body of the deceased and pay respects to the immediate family. Many people, and some cultures, desire that a Rosary be said by those gathered for the deceased. The official rite is a Liturgy of the Word with Scripture reading and prayers. Speak to the deacon or priest who will be presiding at the vigil if you have special requests. The vigil is also a good time for people to publicly share remembrances about the deceased. If holding a formal viewing and Vigil seems inappropriate for a specific reason, it may be appropriate to have the family gather in the presence of the body for a brief prayer service prior to the funeral Mass. Depending on availability, we will be happy to provide a priest or deacon to lead the service. In the case of cremation, particularly, this may help the family to emotionally take leave of their loved one. 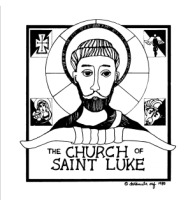 The funeral Mass, at St. Luke, usually begins in the baptistery where we sprinkle the body or cremains with holy water to remind ourselves of the promise of eternal life given through Baptism. When the body of the deceased is present, we place the Funeral Pall over the casket as a reminder of the white garment we are given in Baptism. If cremains are present, the urn may be carried by one of the family members or they may be placed in our Ossuary which is carried by four pall bearers. A prayer book, rosary or other religious article used by the deceased may be carried in the procession and placed on the casket, or on a table up front in the case of cremains when the ossuary is not used. The family is invited to choose the readings which will be used during the Liturgy of the Word and provide readers for the First and Second, if there is one, Readings. If there will be no Deacon at the Mass, the family is invited to provide someone to assist with the Prayers of the Faithful also. For the Liturgy of the Eucharist, the family is invited to provide two or more individuals to bring up the gifts of bread and wine.